Color Splash!® Colored Art Sand, 12 oz. Color or texture any item that you have spread glue onto first - it adds excitement to any project. Fine terrarium sand works well in plastic cups to make scenic sand designs. In 12-oz shaker top containers. Pack of 10 assorted colors. Color or texture any item that you have spread glue onto first - it adds excitement to any project! Fine terrarium sand works well in plastic cups to make scenic sand designs. In 12-oz. 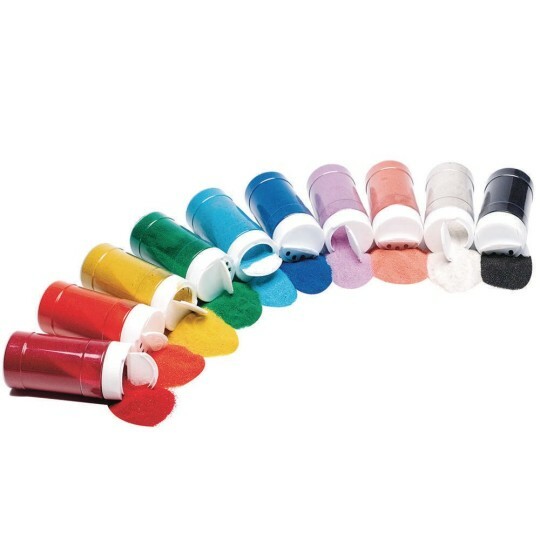 shaker top containers. Pack of 10 assorted colors. A lot of sand for the price will last a long time. These were ordered as part of a summer camp that I run for my company. This year we had around 300 children ranging from Kindergarten through 6th grade. There were multiple arts and crafts for different ages and the color assortment in this pack was perfect for all of that. The bottles were sturdy and stored easily. Sand is a messy thing regardless but the tops on these helped to contain that as much as possible. There are lots of fun colors in here! My preschooler enjoyed playing with them. You could put them in bigger bottles.